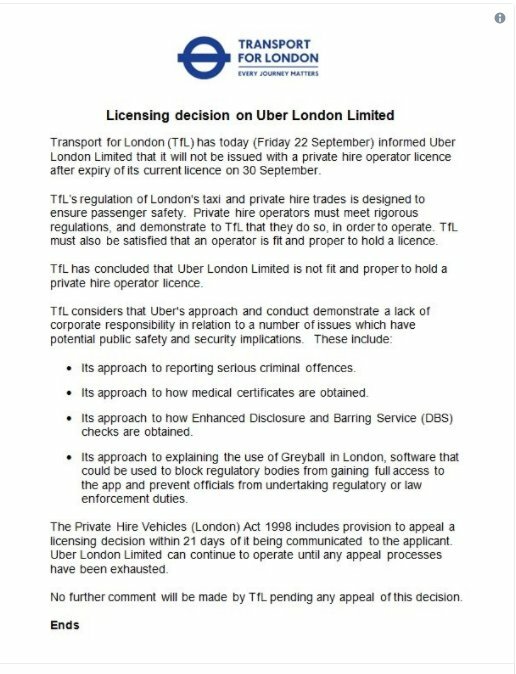 Uber London, operators of Uber car transportation services in London will not have their private hire license renewed after it expires on September 30, 2017. This was contained in an announcement from Transport for London on Friday, September 22, 2017. As a regulatory agency in charge of transport in Greater London, Transport for London, the decision was taken mainly for the protection of public safety. Among many other reasons, the regulator mentioned that Uber was not fit and proper to hold a private hire operator license and that some actions of the ride-hailing company constitute a lack of corporate responsibility. Meanwhile, Uber London has 21 days to appeal the decision of the regulator.